Whether you’re craving greasy pub food and a beer or a cheese plate and glass of wine, there are tons of watering holes in Savannah, Georgia, that will fit the bill. This area offers a wide variety of hotspots that are ideal for a fun and fuzzy night out with friends or a romantic evening of sipping in the sunset. Plus, many of the best bars in Savannah are walking distance or a short drive from the Presidents’ Quarters Inn! Here are some of our favorite places to go for a night out on the town. The Distillery: With 21 craft beers on tap and over 99 bottled beers, the Distillery Ale House on West Liberty Street is a beer-lover’s paradise. This family-owned business features a mahogany topped bar, antique copper still, and delicious pub food that’s the perfect accompaniment to a fresh pint. Churchill’s Pub: Situated in the heart of the historic district, Churchill’s offers a unique blend of traditional British favorites and contemporary American cuisine as well as ever-changing craft beers. They even have a wine bar downstairs where guests can enjoy domestic and international selections and nosh on scrumptious local cheeses. Congress Street Social Club: Sports fanatics will love this buzzing bar on West Congress Street. 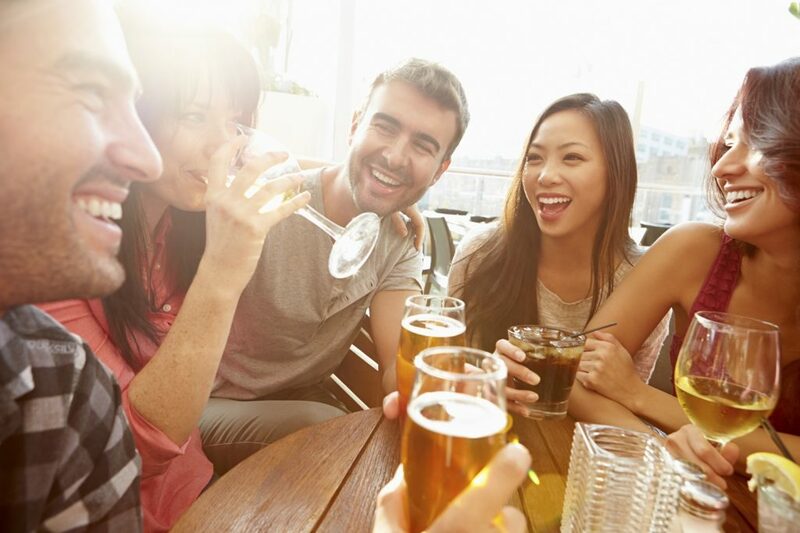 Enjoy delicious American pub fare like burgers and wings, then sit back and savor some live music, a game on the big-screen, and a wide selection of craft beers and liquor. Rocks on the Roof: Located inside the Bohemian Hotel, Rocks on the Roof is one of the best bars in Savannah on River Street and features breathtaking views, a cozy fire pit, live entertainment, and a tapas-style menu with excellent drink and martini choices. The Rail Pub: Lovingly known as Savannah’s favorite dive, this watering hole is located in a historic 1890 building on Congress Street and has a fascinating food and drink menu. Feel free to try some down-home favorites like pickled pigs’ feet, fried chicken, and slim jims, then wash away that salty goodness with a cold one. Jen’s & Friends: One of the best cocktail bars in Savannah, Jen’s has over 300 martini recipes in some unique (and delicious!) flavors. Guests can enjoy dessert-style drinks like the tangy frozen Key Lime Pie, sweet Birthday Cake, or a rich and smoky Banana’s Foster martini. Yum! 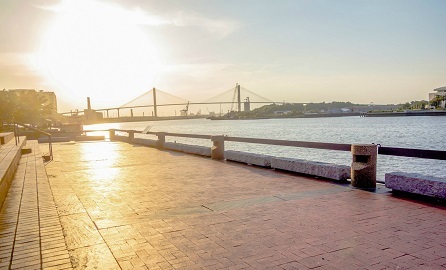 Top Deck Bar: Perfect for a romantic date night, Top Deck overlooks the Savannah River and treats guests to breathtaking sunsets and views of the Talmadge Memorial Bridge. After some eye-gazing, be sure to try the Top Deck Mojito, a signature cocktail that features fresh mint, agave nectar, Sugar Island coconut rum, seasonal berries, and fresh lime juice. 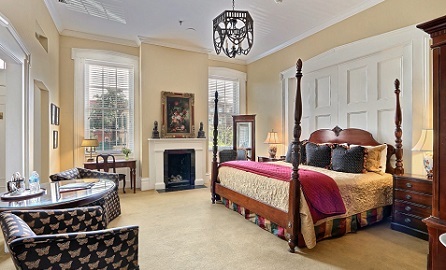 After you’ve had a few too many, head back to our beautiful Savannah bed and breakfast and doze off in one of our comfortable rooms or suites. 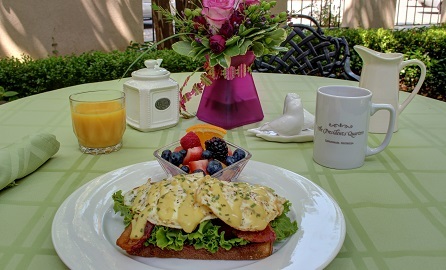 In the morning, you can refuel with a delicious gourmet breakfast to help soak up some of that alcohol. No matter where the evening takes you, Savannah’s eclectic bar scene guarantees a night out that you’ll never forget – and maybe one that you won’t remember!